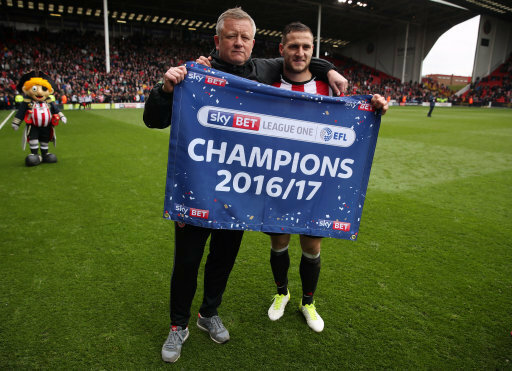 A first half flurry from Sheffield United, who were announced as League One Champions two days previous, was enough to sweep aside promotion chasing Bradford City. The Bantams may now need to turn to the Play-Offs to gain promotion. United remain on course to end the season with 100 points tally, they had taken the lead through Clarke's strike before Billy Sharp notched his 27th of the season. With half-time looming Clarke added his second of the day, and United's 100th goal in all competitions to effectively win the game. Blades boss Chris Wilder made three changes to the side which had won at Port Vale (by the same score-line) on Good Friday. Freeman, Lafferty and Duffy all returned, with Ebanks-Landell, O'Shea and Done dropping to the bench. Former Bradford striker Hanson missed out due to injury. United were electric from the off, and Fleck almost caught Doyle out at his near post in the opening ten minutes. At the other end Wright stood firm to block Diang's effort. In the 13th minute the vast majority of the 26,800 crowd were in celebration as O'Connell surged forward and combined with Duffy before poking the ball into the path of CLARKE whose quick-fire effort was too hard for the keeper to save. The Blades marched on from there and seven minutes later SHARP coolly slotted home from Fleck's through ball in front of the away support. Fleck was then booked for a rash challenge on Cullen. Wright was booked for a tackle on Marshall on 35 minutes and the remainder of the half saw Bradford struggling to force pressure in the final third. In the 42nd minute the Blades supporters were jumping for joy again as Sharp broke free from Duffy's pass and unselfishly pulled the ball across goal for CLARKE who had the easiest of finishes for his 7th goal of the season, and his fifth in four consecutive games. The home faithful had hoped to see their heroes punish the Bantams with further goals in the second half, and in front of the Kop but it wasn't to be but also didn't go without incident either. City came out of the traps much improved but United's defence stood firm for their 12th clean sheet on home soil in the league. Moore was called into action for the first time in the match, saving a McMahon effort. Duffy was replaced by Carruthers on 66 minutes and shortly afterwards Vincelot was booked for a tackle on Coutts. With the clock ticking down Sharp missed his opportunity to further their advantage as he headed straight at Doyle from Carruthers cross. Basham then had two attempts at goal in a matter of seconds. Sharp had been denied before the big defender saw his drilled shot spin in the air and from the rebound couldn't head the ball home and the keeper collected. Three minutes of injury time was added with United happy to play out the game. The newly crowned Champions paraded the pitch in celebration. Sheffield United: Moore, Fleck, O'Connell, Basham, Sharp, Wright, Coutts, Freeman, Duffy (Carruthers 66), Lafferty, Clarke. Unused: Long, McNulty, Done, Ebanks-Landell, O'Shea, Chapman. Bradford City: Doyle, Meredith, Law, Vincelot, Marshall, Dieng (Jones 22) Wyke, Cullen, Knight-Percival, McArdle, McMahon. Unused: Darby, Toner, Clarke, Hiwula, Sattelmaier, Devine.